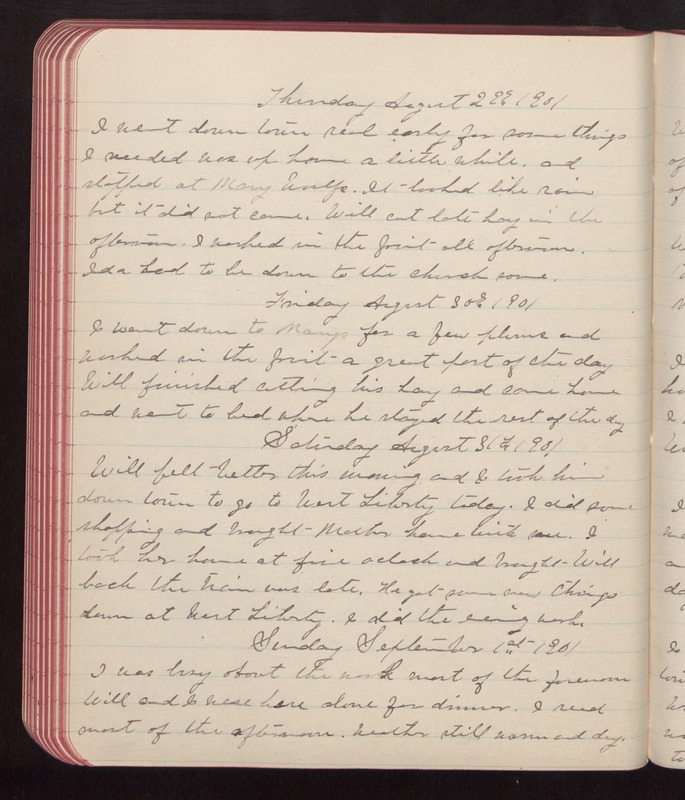 Thursday August 29th 1901 I went down town real early for some things I needed was up home a little while, and stopped at Mary Woolfs. It looked like rain but it did not come. Will cut late hay in the afternoon. I worked in the fruit all afternoon. Ida had to be down to the church some. Friday August 30th 1901 I went down to Marys for a few plums and worked in the fruit a great part of the day Will finished cutting his hay and came home and went to bed where he stayed the rest of the day Saturday August 31st 1901 Will felt better this morning and I took him down town to go to West Liberty today. I did some shopping and brought Mother home with me. I took her home at five oclock and brought Will back the train was late. He got some new things down at West Liberty. I did the evening work. Sunday September 1st 1901 I was busy about the work most of the forenoon Will and I were here alone for dinner. I read most of the afternoon. weather still warm and dry.